From the very beginning, the Russian Ladies Committee took the responsibility of organizing Christmas and Easter bazaars. These events were, and still are, major fundraisers for the RCC. Originally, the bazaars spanned over two days. More recently, they have been shortened to a one day event: the second Saturday in November for the Christmas bazaar, and Good Friday for the Easter bazaar. In the beginning, the bazaars did not only feature authentic Russian food and desserts cooked by the Ladies Committee, but also handicrafts made by members (embroidered pillows, Russian dolls, painted Easter eggs, kitchen hotpads, aprons, towels, etc). 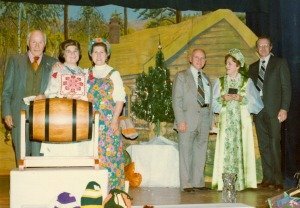 There was also a lottery where prizes ranged from a large deer skin (donated each year by Mr. E. Buyan who owned BC Furs at the time) to a large bottle of vodka. There was always entertainment at the bazaars provided by the Balalaika Orchestra, children's choir and dancers and other ethnic groups who were invited to perform. It was an event where members donated their time and resources to making the bazaars very successful. Today, the organization and planning of the bazaars rests in the hands of Laresa Wright, Marina Pozdnikoff and dedicated volunteers. For over 20 years they have donated hundreds of hours per bazaar, preparing the food, decorating the hall and organizing events for the day. Thank you for carrying on this important tradition!